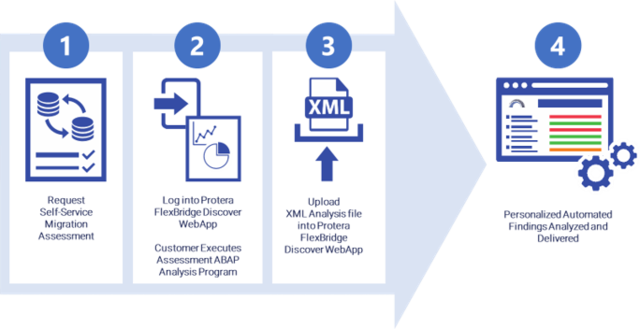 In three simple steps and as little as an hour, a business can receive a comprehensive assessment report and SAP migration plan. The assessment is available to organizations of every scope and size across a broad range of industries, from consumer products manufacturing to transportation, to aerospace and defense. Protera's IT Transformation Acceleration Platform for SAP, SAP HANA, SAP S/4HANA, Enterprise Applications, and Cloud Deployments has delivered 100 percent project success for more than 500 migrations. Learn more about why SAP organizations around the world have come to rely on Protera's end-to-end IT solutions at protera.com/why-protera/, then register for an SAP migration assessment.